There is a reason that Niagara Falls is featured in several tv shows and movies--it really is that spectacular. 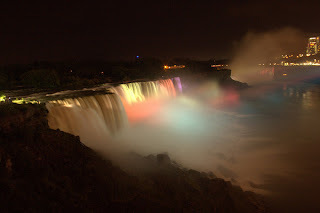 Our tour of the falls actually began an night when the falls are lighted with pastel colors. After arriving in the evening, checking in, and letting the kids swim in the pool for an hour, we went to look at this natural wonder. It was impressive, but a little cheesy with the pastel lights (meant to mimic the perpetual rainbow at the base of the falls during the daytime). I thought maybe I was tired or having an off day. It was cool, very cool, but not spectacular. The big deal came the next day. I didn't realize that I had only seen a small portion of the falls at night--the American falls. In the daylight, the American falls are impressive and large. They can be viewed from the a lookout bridge, explored through the Cave of the Winds Tour (where you can touch the falls), and viewed from above from both the state park and goat island. As promised, a rainbow is almost always visible at the base of these falls. The really big deal is the horseshoe falls. Numerous gallons of water flow at a rate up to 68 miles per hour with such ferocity it is impossible to believe that anyone has survived going over the falls. The view of the horseshoe is as magnificent as any I have seen including the Grand Canyon and perhaps the most amazing view in the United States. Goat Island is really where you will spend the bulk of your time. 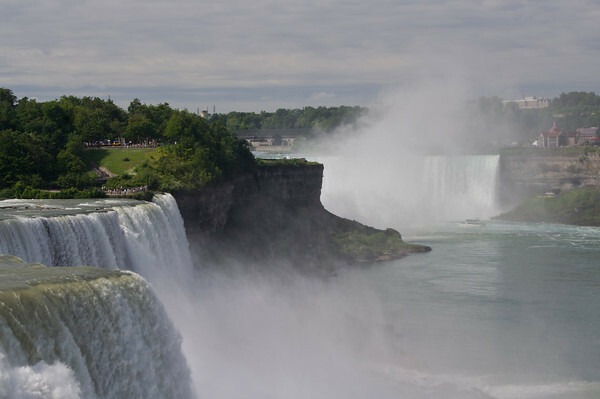 It has the larger parking facility and is home to the Top of the Falls Restaurant as well as the best view of the horseshoe falls and the top of the American falls. You will want to leisurely walk along the path and enjoy the immensity of the sight. 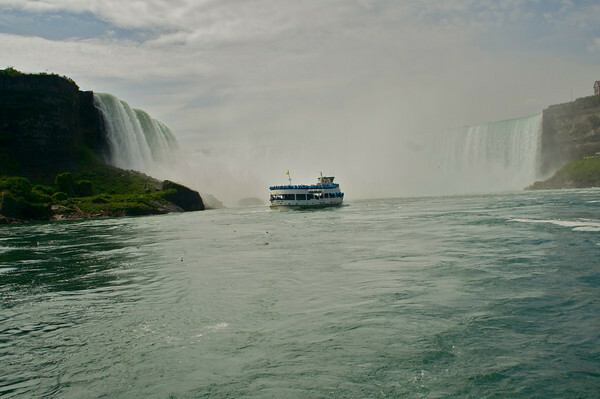 For families with young children and a budget, I recommend Maid of the Mist boat tour instead of Cave of the Wind (if you have to pick only one). Maid of the Mist includes access to the bridge lookout and some viewpoints at the base of the American falls. The real tour is the boat ride which passes the American Falls (have your camera ready) and takes you as close to the base of the horseshoe as possible without being sucked into the Devil's whirlpool. The noise is deafening as is the immense power of the falls. Water sprays the passengers who are wearing tour issued ponchos. Absolutely breathtaking. The New York side of Niagara is very small and has an industrial feel. A few restaurants, a few shops, a few street vendors. The Canadian side has a Vegas feel with amusement rides, neon lights, and plenty of casinos, nightlife, food, and fun. Niagara Falls is also a state park not a federal park with only a small museum and gift shop compared to the larger ones that you see at federal sites such as Yellowstone. If you haven't seen the falls, you need to add it to your bucket list. Be sure to include a meal at the Top of the Falls Restaurant, go on one of the tours, snap tons of pictures, visit Canada, stop by the visitor's center museum to discover who has survived a trip down these enormous falls. It is truly an amazing view and natural wonder. You would really have a great experience if you'll go to Niagara Falls. It's very beautiful and you won't see anything like it. Niagara Falls is famous for its natural surroundings and exotic places. People come here to spend the holidays with their family, friends and beloved ones. Besides the beautiful natural habitat, they have also a famous Italian restaurants in Niagara Falls that allow the visitors to enjoy the delicious Italian cuisine. Niagara Fall is a place worth visiting ones. There are ample of things visitors can do here. There are numerous Niagara Falls hotels, restaurants, theme parks, tourist attractions, waterfalls to make the holidays of visitors a time to cherish for a long time. Niagara Falls is really nature's marvel, its amazing waterfalls, lots of attractions, tourist activities, luxury Niagara Falls hotels and restaurants make this place perfect tourist destination.